One of the most common usage errors is subject-verb disagreement. The next two lessons will give some guidelines for avoiding this problem. The subject of the verb was is oatmeal. Nouns and pronouns can be either singular (i.e., dog, beach, foot, he) or plural (i.e., dogs, beaches, feet, they). What you may not know is that verbs can be singular or plural too. Only present-tense verbs have a different singular and plural form. The only exception is the verb be, which also has a different singular and plural form in the past tense: was and were. That’s why it’s correct to say the dog barks or the dogs bark, but incorrect to say the dogs barks or the dog bark. We call this subject-verb agreement. The rule is simple: Singular verbs agree with singular subjects and plural verbs agree with plural subjects. Notice that the last example includes a verb made up of more than one word — was invented. This is known as a verb phrase. Whether a verb phrase is singular or plural depends on the form of the first helping verb, in this case was. The main verb in a verb phrase (invented) stays the same whether it’s singular or plural. Things get tricky in the following situations. Pay attention to the rules below. Learn them and you will avoid most of the common problems with subject-verb agreement. I am the most wonderful person I know. 1. Sentences that begin with there or here. Don’t be fooled; there and here are not the subject of these sentences. 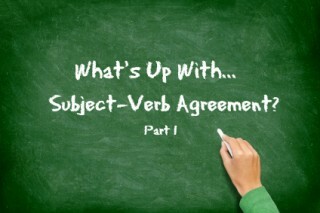 Look after the verb for the subject and make your verb agree with it. Here is your answer. Here are your gloves. There is a hair in the butter. There are onions in the suitcase. 2. Some sentences that begin with prepositional phrases. The subject of a sentence will never be found in a prepositional phrase. Be careful to identify the subject in order to choose the correct verb form. In the treasure chest are forty gold doubloons. On the crest of the hill sits a lonely peasant cottage. 3. Some interrogative sentences. Some sentences can be turned into questions by inverting the subject and verb or by setting the subject between the parts of a verb phrase. The agreement rule remains the same here, though. Is the show about to begin? Do your cousins like guacamole? In all of the examples in this lesson, the same rule applies: singular verbs (with an s) agree with singular nouns, and plural verbs (no s) agree with plural nouns. 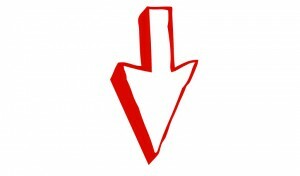 In the situations above, the tricky part is identifying the subject. Once you can do that, making the verb agree should be simple. In the next post, we’ll talk about three more kinds of sentences that make subject-verb agreement more challenging. Click HERE to download a printable practice exercise on this lesson! 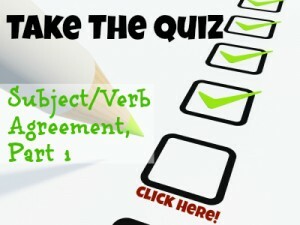 Take the quiz on Subject-Verb Agreement, Part 1! We greatly appreciate comments. Please leave yours below. Thanks for the question, Cheryl. The verb in that final example is “do like.” It’s a verb phrase, and what I didn’t explain in the article is that the number of a verb phrase is determined by the helping (auxiliary) verb. I place this example under “Inverted Sentences” because questions are commonly formed by splitting verb phrases this way. I have made both parts of the verb bold in that last example and added some explanation about helping verbs/verb phrases earlier in the article. Thanks for helping me clarify these posts! In the last example for questions an s/v agreement you have “do” highlighted” and I see how if it were “cousin” it would change “do” to “does”. But then what is “like”? The cousins aren’t “doing” something – unless “like” is what they are doing. They are “liking” the guacamole thought right? And “do” is acting as an emphatic helping verb isn’t it? So would it be more clear to explain this under helping verbs rather than just questions? The same would be true for “have” “be” correct? I know these make the perfect and progressive or pasive forms of verbs, but they still have to agree with the subject right?